It’s official! Viking Cruises, which last year set a new world record for ship christenings in one day with eight ships, has now set a new record with 14 ships named within 24 hours. 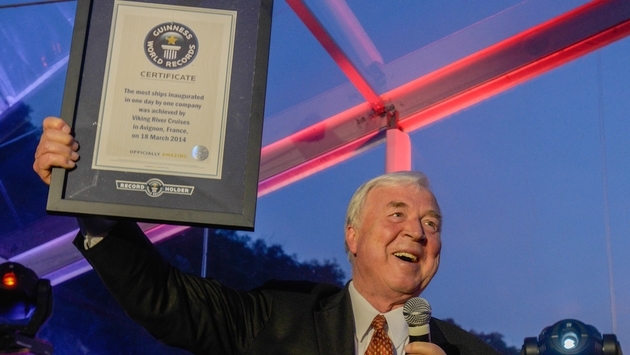 The Guinness World Book of Records on March 18 officially presented Viking Chairman Tor Hagen with a plaque commemorating the mass christening during a celebratory dinner next to the famed Pont du Gard near Avignon, France. Viking actually named a total of 16 of its Longships over the last two days, but some of those vessels were already in operation so couldn’t technically qualify according Guinness rules. Longships are Viking’s uniquely designed vessels designed to accommodate 190 passengers each on the rivers of Europe. They feature squared off bows and asymmetric corridors, which allow them to fit eight more cabins and 30 more passengers in each vessel, compared to other companies’ European river ships. Every cabin on the third and second decks also has a full balcony. Hagen says these economies of scale allow Viking to charge a lower price than his competitors. Viking also isn’t done yet. It will christen two more ships in Porto, Portugal, on March 21. Neither one of those vessels will be Longships, since they are designed to sail the Douro River in Portugal. Viking now has 30 Longships, none of which is older than two years. In total, the company will have 53 ships this year. Hagen also says it will build another 10 Longships next year for the European market. Not bad for a company that was started by Hagen 17 years ago in Russia with just four ships. For those who suggest that Viking is building too many ships, Hagen has the answer: He says his vessels are sold out April through October this year, which is the peak river cruise season in Europe. 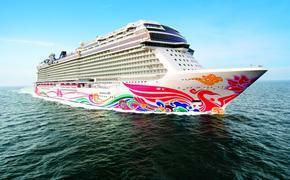 Viking now claims $1 billion in annual revenues and carries 10,000 passengers a day in season. Hagen also points to the exponential growth of river cruising. From 2001 to 2014, he says, river cruising grew at an 11 percent annual rate. During the same time, he says, Viking has grown 31 percent per year and at a 40-45 percent growth rate in the last five years alone. Hagen says his company now has a 48 percent share of the river cruise market today, compared with just 20 percent five years ago. This year's christening festivities began on March 17 with the naming of nine new Longships in Amsterdam. Those vessels included Viking Alsvin, Viking Baldur, Viking Bestla, Viking Delling, Viking Eistla, Viking Gullveig, Viking Ingvi, Viking Lif, Viking Magni. Then on March 21 Viking will christen the Viking Torgil and Viking Hemming in Porto, Portugal.